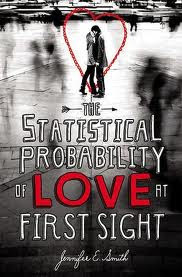 Jennifer E. Smith’s TheStatistical Probability of Love at First Sight is a gem. Over the course of twenty-four hours, the novel tackles many different kinds of love: romantic, parental, hopeful, and even love in spite of disappointment. This is an optimistic and heartwarming novel that you will speed through. Fate is a favorite subject of mine. I love the movie “Sliding Doors” and thinking about how one slight difference can change everything. In Hadley’s case, she misses her flight to her father’s wedding in London by four minutes. These four minutes lead to her meeting Oliver, a cute British boy who will figure very importantly in her life. Over the course of the flight, the pair discusses topics both heavy and light: her father is marrying a woman that Hadley has never met, Oliver attends Yale as a way to rebel, Hadley has a fear of mayonnaise, and Oliver’s favorite animal is the eagle. Smith captures the immediate intimacy of the couple, leaving the reader grateful that Hadley missed her flight. Hadley’s relationships with her parents are realistic. She feels betrayed by her father, who went to teach in Oxford and ended up staying permanently. Hadley is defensive of her mother, who is rebuilding her life and has found happiness again. It seems that everyone is better off after the divorce except Hadley, which leaves her resentful. It feels very authentic for her to lash out at them, regret it, and not know how to makes amends. Readers will see themselves in these interactions and feel heartened by how they are resolved. The Statistical Probability of Love at First Sight will appeal to many readers. Fans of Sarah Dessen and Jenny Han novels will enjoy this entry to the YA romance genre, and everyone has to love that amazing cover.